Lonely Always - the new Threk Michaels album! Lonely Always (More Songs for Ricky) is the new album from critically- acclaimed Nashville singer/songwriter Threk Michaels. Beautifully recorded for superior "Sweet Little Ricky" sound and produced in accordance with the highest Rick & Roll standards, the album contains ten original tracks based on Ricky Nelson's timeless, classic song "Lonesome Town." Lonely Always features stunning musical performances by the world-famous vocal group the Jordanaires and the acclaimed "More Songs For Ricky" Hall of Fame Orchestra, featuring Joe Osborn, Glen D. Hardin, Jimmy Capps and Eddie Bayers. Album coordination and supervision was supplied by rock legend & former Ricky Nelson bandmate Joe Osborn, who was the driving instrumental force behind such fabulous Nelson fan favorites as "You Are the Only One," "Hello Mary Lou (Goodbye Heart)," "Travelin' Man," "A Wonder Like You," "Everlovin'," "Young World," "It's Up To You" and countless other Ricky hits! Written and sung exclusively by the gifted Michaels in the style of Ricky's most cherished acoustic ballads, this unique one-of-a-kind song-cycle about loneliness is truly the ultimate lonely-blue collection, each song lovingly dedicated to those who feel they'll always be "Lonely Always." Highly recommended for fans of Ricky Nelson, Gene Pitney, Roy Orbison or the Everly Brothers. Hear clips from Lonely Always on the album's own MySpace page! 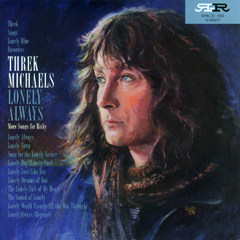 Tim Sendra of The AllMusic blog says "...Michaels captures loneliness under glass and studies it like a scientist..."
Threk Michaels and Lonely Always are marketed exclusively by Excitable Press! FIVE EASY WAYS TO BUY THREK'S LONELY ALWAYS! 4) You can preview individual tracks or purchase Lonely Always from online retailer CD Baby.